2005. 8" x 6". Edition of 45. Eight pages with eight linocuts and eight poems about writing, drawing, teaching and learning. Images are figurative drawings made from single lines, drawn at the ice skating rink. Letterpress printed from handset type. Linocuts are printed in single colors: two blues and a pencil-colored yellow. With graphite and painted paper covers and painted strips that join the pages. Pencil hardnesses from 1B to 8B are stenciled on the text pages (in pencil, naturally). 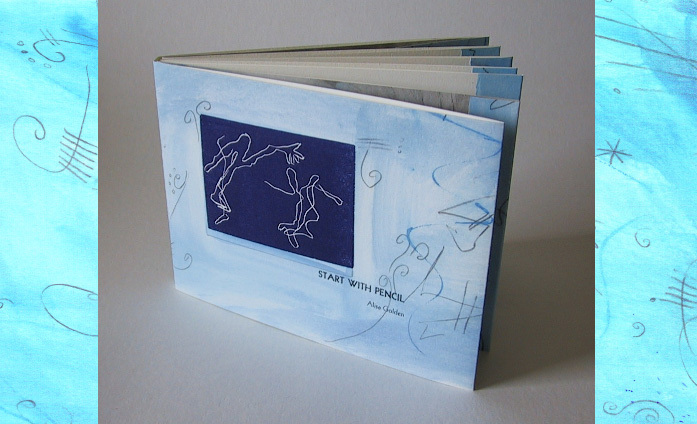 A slim, softcover, mixed-media accordion book. "I used to hear these lines / now I say them."